Since peaking in 2009, U.S. gum sales have fallen 11 percent to $3.71 billion last year, according to market researcher Euromonitor International. That’s even as overall candy sales — including gum, chocolate, mints and licorice — have climbed 10 percent to $31.53 billion. Over the next five years, Euromonitor projects gum sales will drop another 4 percent to $3.56 billion. NEW YORK – Gum seems as appealing as that sticky wad on the bottom of a shoe these days. It’s not that Americans don’t ever enjoy a stick of Trident or Orbit, the two most popular brands. They just aren’t as crazy about chomping away on the stuff as they once were, with U.S. sales tumbling 11 percent over the past four years. No one in the industry can pinpoint a single factor that’s causing the decline – the theories include an unwillingness to shell out $2 or more for a pack in the bad economy or that advertising veered too far from underlining gum’s cavity-fighting benefits. But the biggest reason may be that people simply have more to chew on. From designer mints to fruit chews, candy companies have invented plenty of other ways to get a sugar fix or battle bad breath and anxiety. The alternatives don’t come with gum’s unpleasant characteristics either, like the question of whether to spit out or gulp the remains. They’re also less likely to annoy parents, co-workers or romantic interests. The gum chewing habit dates as far back as the ancient Greeks but arrived in the U.S. in its modern form in the 1860s, according to Mars Inc., the No. 1 player in the market with its Wrigley unit. But gum’s image as a tasteless habit also stuck, with some high-profile gum chewing only making it worse. In 2003, Britney Spears gave an interview to CNN where a white piece of gum could be seen floating around her mouth as she fielded questions on a range of topics, including the war in Iraq. “My grandmother used to tell me, ‘You look like a cow chewing cud,’ ” she said. Gum’s bad image is one reason that alternatives look more attractive. 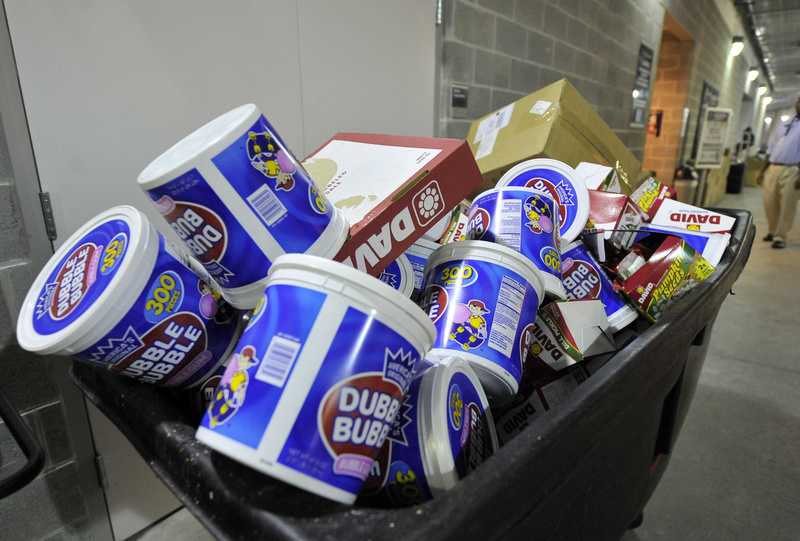 There’s also another perennial complaint: “The flavor runs out too fast,” said Ryan Furbush, a 17-year-old from Sayreville, N.J., who has stopped chewing gum in favor of chewy candies and chocolates. It may be why Mars said its gum declines have been most significant with people who are 25 and younger. In the meantime, Altoids mints, Welch’s Fruit Snacks and countless other options have taken up space in the checkout aisles where most gum is purchased. Steven Schiller, global head of Hershey’s non-chocolate candies including mints, said it gives gum chewers an alternative that doesn’t require “disposal” at the end. “We know when people have gum in their pocket or backpack or desk, they’re much more likely to chew it,” said Stephanie Wilkes, who heads the North American candy business for Mondelez, the No. 2 player in gum with Trident, Dentyne and Bubbalicious. Mars, which makes Big Red, Doublemint, Juicy Fruit and Orbit, is testing illuminated racks in candy aisles to make its gum and candy stand out more. The company said the racks have led to a 10 to 30 percent sales increase in tests. And after years of slowly vanishing from shelves, Bazooka bubble gum last year relaunched its brand with new marketing and packaging. Distribution has since rebounded. Still, executives are realistic about gum’s turnaround prospects. “We’re not expecting any dramatic recovery in the category anytime soon,” Mondelez CEO Irene Rosenfeld said during an earnings call last month.